Phew, I made it. The Shoo Fly quilt was finished on time and gifted today, just as planned. It all started with a very traditional Shoo fly block, which I enlarged to make it more modern. Each block finished at 12.5", as opposed to the usual 5" or 6". And, I think using these bright, happy, and saturated colors completely transformed the block. I had a little trouble deciding what fabric to use for the binding. I usually like to use dark fabric to frame the quilt, but it was standing out too much. I'm glad I went with this green striped fabric by Malka Dubrawski. I think it matches the whole quilt perfectly. My oldest daughter was helping me with taking pictures of the finished quilt, so of course there were some silly poses, and Domo slippers (love those). I posted a tutorial on how to make these fun, simple blocks here, if you'd like to make your own Shoo Fly quilt. First, thank you so very much for your wonderful response to my Whirligig pillow giveaway. I loved reading each and every comment you left me, you guys really know how to make a girl feel on top of the world. So, thank you again. 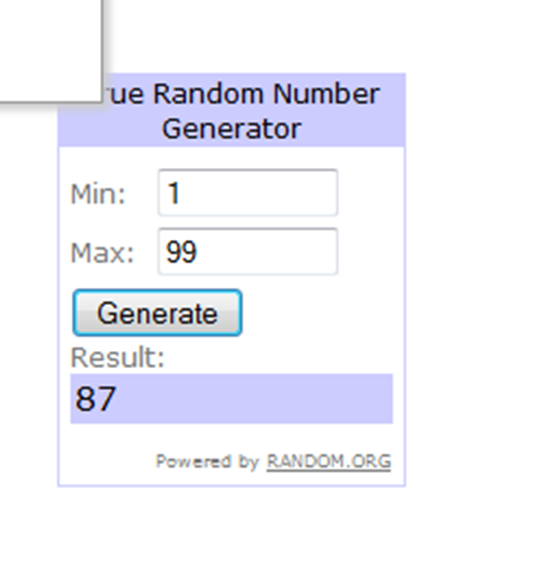 I enlisted Mr. Random's help in choosing the winner. 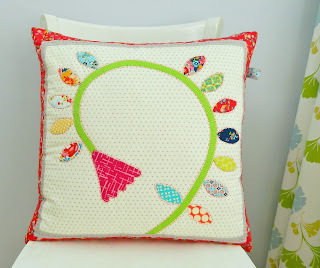 I enjoy needle turn applique too and appreciate a chance to win this pillow top. It's gorgeous. Last night I finished my Shoo fly quilt top. It was a serious race against time as I knew I had to finish this quilt top since I still need to baste and quilt it, obviously, and I want it to be ready by Sunday to be given as a gift to one special 11 year old girl. Fortunately, these blocks are pretty big (12.5" square) and once I found a system of working in batches, they came together quite painlessly. I love how pretty, bright, and modern looking this block is. Oh, and chunky! I love chunky blocks. So, I thought some of you might appreciate a tutorial on how to make this fun 12.5" block. Ready? here we go! Choose two contrasting fabrics for your block. I chose red and white polka dot fabric for the main part of the block and white solid fabric for the background. From the main fabric, cut out 2- 5" squares, and 4 - 4.5" squares. From the background fabric cut out 2 - 5" squares and 1- 4.5" square. Take your 2 - 5" white squares and draw a line dividing each square into 2 equal triangles. 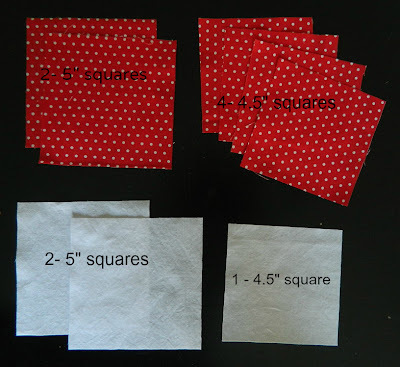 Place one 5" white square on top of one 5" print fabric (right sides together), pin in place, and sew a 1/4" along both sides of the line you drew in the previous step. Do the same with the second set of 5" squares, once done take your block to your cutting mat and cut along the drawn line. Now you have 4 HSTs. Press your HSTs open and trim to 4.5" squares. 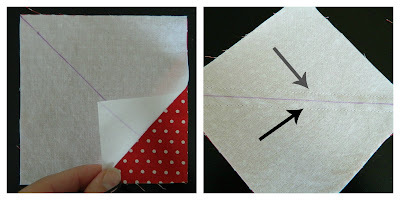 Now arrange your HSTs, as well as squares you cut out at the beginning, into a shoo fly block. First, sew the rows of 3 block together, press. I like to press my seams the way shown in the picture as this makes sewing rows together a lot easier as there are no bulky seams to go through. Now sew the rows together and press the seams, at this point I press my seams open. Trim, if needed, and you have one lovely 12.5" Shoo fly block, all finished. Wasn't that easy? I made 20 of these colorful blocks, so my quilt top measures 48" x 60". A perfect size for a child's quilt, if you ask me. So, I started a new quilt yesterday. My plan was to keep working on my Don't be Crabby! baby quilt. And then, before I knew it, the stack of gorgeously colorful fabric "appeared" in front of me and I started cutting and sewing like there was no tomorrow. I decided to make a shoo fly quilt. I had to do my own math because in my haste I did not have time to look for instructions on how to make a 12.5" shoo fly block - I'm really glad it worked out. I love how big and chunky these blocks look. I'm really looking forward to working on this quilt tonight. And, while I do, I will try very hard not to be reminded of all the other projects this quilt managed to push to the back burner, especially my Don't be Crabby! baby quilt. Only a few more circles need to be finished and I'll be ready for the next step - I'll share more on this project later. Oh, before I go I wanted to share these simple, yet wonderfully graphic blocks I made for Trust circle of do.Good Stitches. These blocks were designed by sew happy geek. Aren't they wonderful? 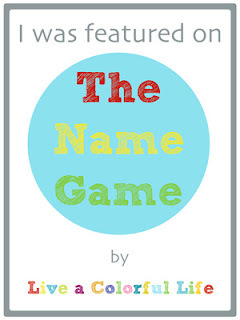 Just wanted to pop in real quick and let you know that I'm playing The Name Game over at Cindy's Live a Colorful Life. Hope you'll stop by. Also, if you're looking for the giveaway of my Whirligig pillow, click here. Today was a lovely, relaxing day. It's pretty cold outside, which I like very, very much, so we spent our afternoon inside playing and reading. I even managed to squeeze some sewing time in and finished my needle turn applique pillow. This pillow is 100% inspired by two amazing ladies, Sarah Fielke and Mary (Molly Flanders). I adore Sarah's new book Quilting from little things and this pillow is a mix of these two projects from her book. I've been eyeing these quilts for quite some time but it wasn't until I saw Mary's amazing version of Whirligig quilt that I finally could not resist and had to give it a try. I know the slow process of needle turn applique is not for everyone, but I can honestly say I love it and I'm totally smitten with the final result. I liked this project so much that I even decided to use some of my precious Liberty fabric for the border. I then used some fun Modern Vintage fabric for the back of the pillow, installed a hidden zipper closure and the pillow was finished. Yay!!! It's quite big (20" x 20") and so wonderfully squishy, just like a pillow should be. 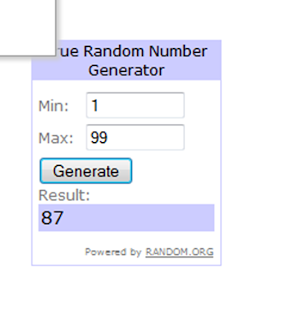 I hope you're still with me, because now we're getting to the giveaway part. Would you like to win this pillow cover? All you need to do is leave a comment on this post, please make sure I have your email address, and you're in. This giveaway is open internationally and will close on Thursday night (27th). I'll announce the winner on Friday morning. Last night I started working on a new quilt using Laurie Wisbrun's newest fabric collection Don't be Crabby. So far, it's all about perfectly round circles featuring adorable creatures and some lovely, bold polka dots. My circles are about 6" in diameter each and I'm using this tutorial by the amazing Amy (badskirt). Be back soon with more progress. Hope you all have a wonderfully restful and creative weekend. Yay! The Pow Wow quilt for my son is bound, washed, dried, softened, and ready for snuggling. It all started with this stack of fabric. I was planning on making a simple patchwork quilt for our family room, but these colors begged to become a new quilt for my son's bed. So, I went through the stack again, taking away some of the girly/ flowery fabrics, and adding a few more boy appropriate ones. I followed Pow Wow pattern by Allison (Cluck Cluck Sew) to make the quilt top. I've loved this pattern from the moment Allison first showed it on her blog and I was really happy to give it a try. Well, happiness only lasted a while - after just a few blocks I realized that I didn't particularly like piecing triangles. Fortunately I figured that if I worked on a few blocks at a time the whole process did not seem as painful, and totally worth it. Once the quilt top was finished, I decided hand quilting was the way to go. I must admit, my fingers are as sore as can be, but I really adore these chunky hand stitches - they give an extra dose of charm and character to the whole quilt, don't you think? I then used this pretty gray/ white striped Riley Blake fabric for the binding. I think it matches the quilt perfectly. I must say, I'm totally in love with this quilt. It turned out as great as I had imagined. And, it works really well for pretend flying, too. For the last couple of days I seemed to have had a serious case of sewing induced ADD. I kept switching from one project to another and to make matters even worse, I even started a few new projects. Today seems much better, though. I'm on task. I've just finished Pow Wow quilt for my son (pictures coming soon). In my craze to start new projects instead of finishing the ones I was working on, I started this new pillow cover to match my son's new quilt. I think some hand quilting on this little guy will be "just what the doctor ordered". Speaking of hand quilting, let me show you more of that sneak peek I gave you on Sunday. What do you think? It's my own variation on Sarah Fielke's Whirligig from her latest book Quilting from little things. These colors make me so happy. I just want to add a few more rounds of hand stitching to the border and then turn it into a pillow. I had a great sewing day yesterday. On a whim, I decided to start a new project. Want to have a peek? Ta-da! After seeing Mary's version of Sarah Fielke's Whirligig quilt I just had to give applique a try. I so LOVE working on this project. Hopefully I'll find some time to get more hand quilting done today. What have you been up to lately? Any new projects?